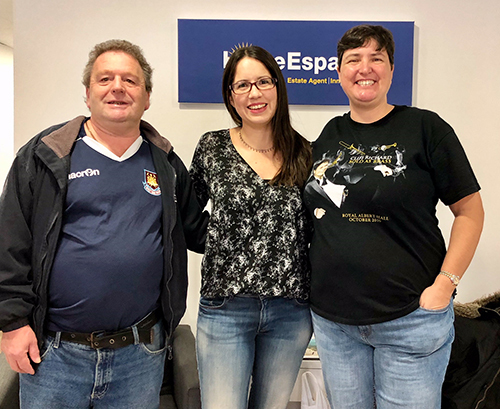 The dream of starting a new life in Spain is becoming a reality for Kevin and Lynn Webster, thanks to HomeEspaña finding the couple their ideal home near the city of Valencia. The couple got the keys to their detached villa at the start of February 2018, buying it outright for €150,000, excluding costs. Their new home is part of an urbanisation on the edge of Olocau, a pretty town under the Sierra Calderona mountains, just 10 minutes’ drive from Llíria and 35 minutes from the centre of Valencia. The Websters first looked at relocating further south in the area around southern Murcia and Almería, but after a trip there in February 2017 decided it wasn’t right for them. After browsing the internet, they discovered the Valencia region and were attracted to properties offered by HomeEspaña. “So we flew out in August and met up with HomeEspaña’s agent Conor,” continued Lynn, who worked in a school. “He was very helpful and suggested we should see what we could get if we stretched our €100,000 budget a bit more. Sure enough, we didn’t just love the Olocau area but fell in love with the fourth property he showed us and bought it. You really get a lot for your money in Valencia, especially compared to London. The Websters’ villa came furnished and in excellent condition and includes four bedrooms, two bathrooms and a large living/dining area. It sits on a 1,000-square-metre plot, with a large private pool, solarium, outside shower and WC, and landscaped garden. It is a short walk from the urbanisation’s social club, bar and tennis courts.